That’s Saleem reading some of the pieces that are on display in the show. In each piece, those cutting phrases are written above a collage of vintage imagery from 1950s and ’60s ads, mixed with Urdu writing and charcoal drawing. They’re like reading entries from his journal, he told me, as he tried to process the feeling that so many of his generation express today. I met the artist at Vision Gallery recently, and he gave me a tour of the show. We started standing in front of the first — and largest piece — in the exhibition, one that depicts a burning house and some words written in Urdu. 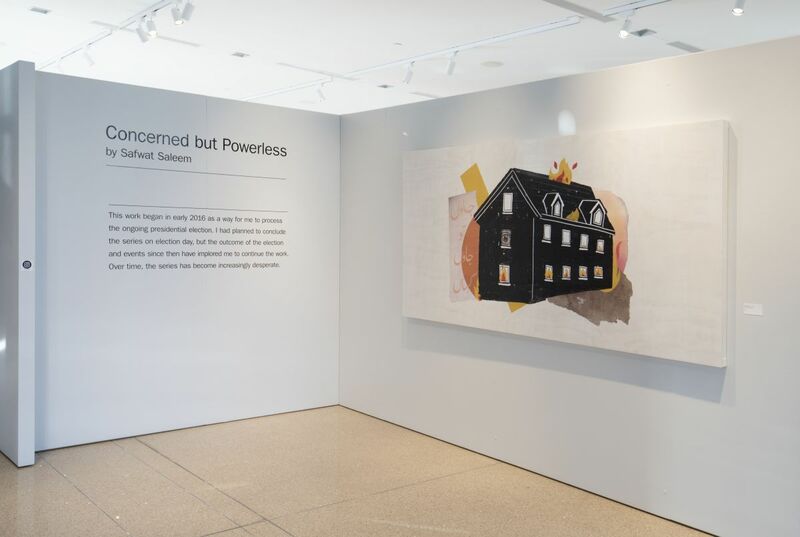 You can see Safwat Saleem’s show, “Concerned, but Powerless” at Vision Gallery in downtown Chandler until March 2.